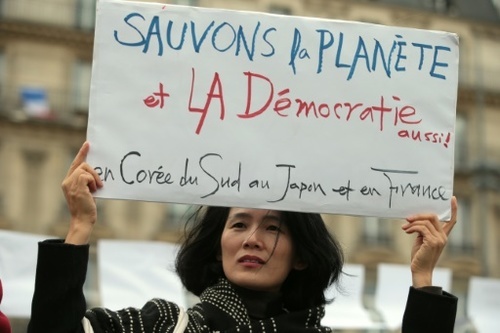 Toutes les dernières nouvelles sur les manifestations sur les changements climatiques à travers le monde dimanche. 10:30 GMT - WELCOME TO AFP'S LIVE REPORT on the worldwide rallies demanding action on climate change ahead of a major summit in Paris. Tens of thousands marched across Australia earlier in a third day of demonstrations across the globe calling on world leaders to strike a pact on cutting greenhouse gases at the COP21 conference. Around 150 leaders including US President Barack Obama, China's Xi Jinping, India's Narendra Modi and Russia's Vladimir Putin will attend the UN talks from Monday, tasked with reaching the first truly universal climate deal. 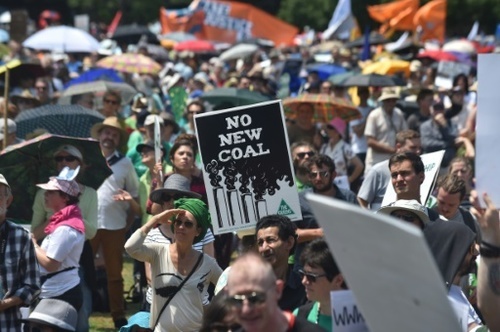 10:49 GMT - Rallies demanding limits on carbon emissions have been growing since Friday, with the latest ones in Australia kickstarting a final day of mass protest around the world. 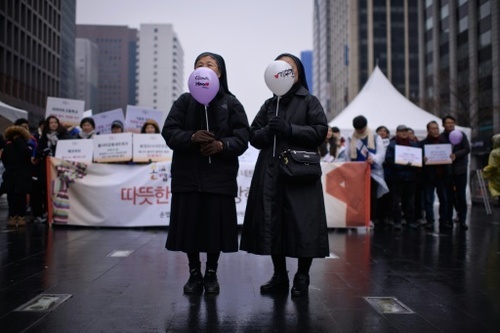 Similar events are planned for Rio de Janeiro, New York and Mexico City, while 1,000 have already braved the rain in Seoul. 11:00 GMT - The goal of the much-anticipated climate deal is to limit average global warming to two degrees Celsius (3.6 degrees Fahrenheit), or less, over pre-Industrial Revolution levels by curbing fossil fuel emissions. But there are numerous potential stumbling blocks, ranging from financing for climate-vulnerable countries to scrutiny of commitments to curb greenhouse gases and even the legal status of the accord. 11:07 GMT - In Paris itself, where world leaders are due to arrive today, any climate change rallies are banned, along with other street protests, under security measures put in place following the November 13 terror attacks. Despite this, a human chain has already begun to form on the historic Boulevard Voltaire in the heart of the capital. People chant defiantly: "State of emergency, police state, you can't take away the right to protest." 11:19 GMT - The human chain is only around 100m from the Bataclan theatre, where 89 people were massacred as part of the wave of coordinated attacks that left 130 people dead. The assault, claimed by the Islamic State group, undoubtedly casts a shadow over the upcoming talks, taking place under heightened security. Some 2,800 police and gendarmes will be responsible for security at the conference while 8,000 additional law enforcement personnel are to be deployed at France's borders. 11:32 GMT - Hundreds of demonstrators are now standing in the chain near the Bataclan, hands linked and chanting "Hear our voices, we are here." In some cases whole families have turned out to protest, AFP's Guy Jackson tells us. Other chants ring out: "We are here for humankind" and "change the system". Police are present but allow the protest to continue despite the ban. 11:40 GMT - "I hope this time the conference will lead to something solid," says Denis Diderot, a retired university teacher who joined the Paris protest wearing a beret and a prestigious French medal, the Legion d'Honneur. The human chain already stretches some two kilometres (1.2 miles) but protesters have left a 100-metre (300-foot) gap in front of the flowers left outside the Bataclan concert hall as a mark of respect to victims of the Paris atrocities. 11:47 GMT - The 53 countries of the Commonwealth have signed their own agreement on climate change, raising hopes for a deal in Paris, according to Maltese Prime Minister Joseph Muscat. "The fact that we have achieved convergence and near unanimity on a very focused statement on climate change puts the possibility of a success at COP21 in better shape," he tells a press conference closing the three-day Commonwealth summit on the Mediterranean island. 11:50 GMT - The Commonwealth says it is "deeply concerned" about the disproportionate threat from an ever-hotter planet to its most vulnerable members. "Climate change unites us, it puts us all in the same canoe. If a big wave comes, that canoe is going to be washed away with everyone in it," President Baron Waqa of Nauru warned at the closing press conference in Malta. 11:56 GMT - At the iconic Place de la Republique in Paris, several hundred people have defied a ban to turn out and protest, again with no intervention from police, AFP's Alexandre Hielard reports. There are cries of: "If we don't march, it won't happen!" Other activists, instead of marching, have piled up thousands of pairs of shoes in the square -- weighing more than four tonnes according to organisers. One pair of running shoes was left by UN Secretary General Ban Ki-Moon. 12:06 GMT - A broad range of causes and nationalities are represented among the Paris protesters, AFP's Alexandre Hielard tells us. There are banners calling for the right to drinking water in Gaza alongside Japanese citizens who fear another Fukushima disaster. But all are united in their calls for a climate change deal. Janis Krisch, 20, a student from Stuttgart, says: "I hope the leaders will finally find an agreement to stop climate change. "I really do think that the global community realizes that it must do something now." 12:17 GMT - A huge puppet is crossing the Place de la Republique in Paris, towering above the throng of protesters. 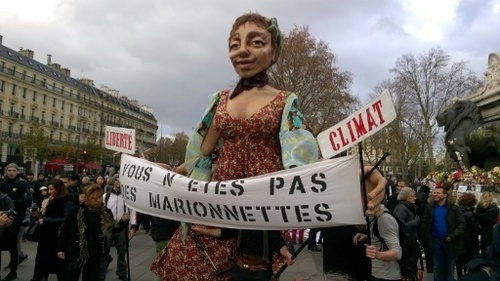 "She is commemorating the victims of terrorism and climate change," explains Xavier Reno of "The Disobedients" collective, which called for protesters to turn out despite the restrictions. 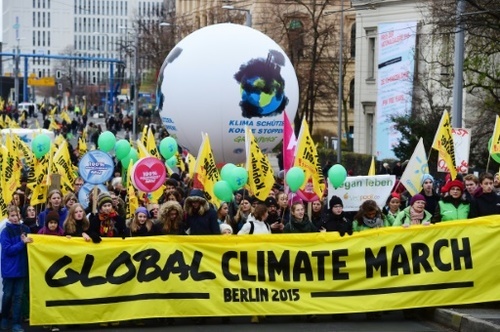 "On questions of individual freedoms and climate, leaders are treating us like puppets." 12:27 GMT - Meanwhile protests are getting under way in several other European cities including Madrid, London, and Amsterdam. Thousands of activists have rallied outside the central train station in Berlin, waving banners reading: "Don't nuke the climate" and "Mrs Merkel, protect the climate, stop coal". 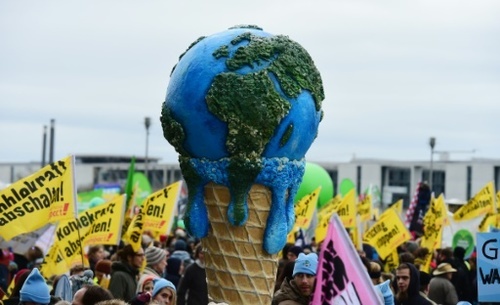 Berlin protesters march with an arresting symbol of global warming as part of the worldwide "Global Climate March"
12:45 GMT - Leaders have already begun arriving in Paris ahead of the talks that start officially tomorrow. AFP photos show French President Francois Hollande welcoming Canadian Prime Minister Justin Trudeau for a meeting at the Elysee palace. 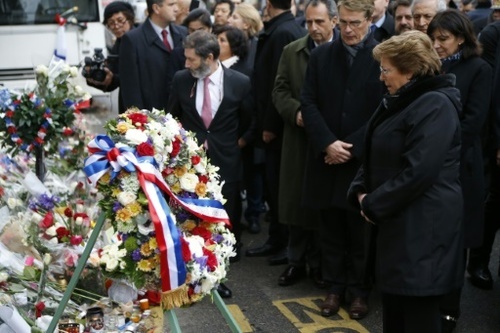 Meanwhile Chilean President Michelle Bachelet paid respects to the victims of the Paris attacks, among them three Chileans. Visiting the Bataclan attack site, she laid a wreath and said: "Fear and terror will not affect us and we will continue, more than ever, to fight for peace. We came to express our condolences to the family (of the Chilean victims), but also to the French families and to the French people. "